MPJE® Made Easy, Materials to prepare for the MPJE® exam. 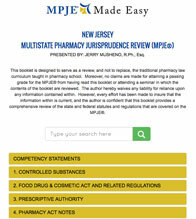 The #1 resource for preparing for the NJ MPJE®. Newly expanded to 120 questions to correspond exactly to the real exam. Every effort has been made to have the questions reflect the specific information that you are expected to know for the exam. They are based on the MPJE® competency statements. In addition, the answer format is the same as on the MPJE® exam. NOTE: The exam is designed to be completed in one session. However, should you experience any technical difficulties or wish to access the exam again, simply e-mail jmush@mpjemadeeasy.com and your access will be reset. Pay online now and start preparing for your exam immediately. All questions provide feedback that includes a complete explanation of the correct answer (regardless of your response) to further help you remember and retain the logistics of each question. The BEST NJ MPJE® online manual. This is the most comprehensive online manual available for preparing for the NJ MPJE®. Pay online now and start preparing for your exam immediately. This booklet is designed to serve as a review, and not to replace, the traditional pharmacy law curriculum taught in pharmacy school. However, every effort has been made to insure that the information within is current, and the author is confident that this booklet provides a comprehensive review of the state and federal statutes and regulations that are covered on the MPJE®. The #1 resource for preparing for the PA MPJE®. Every effort has been made to have the questions reflect the specific information that you are expected to know for the exam. They are based on the MPJE® competency statements. 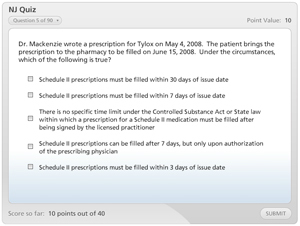 In addition, the answer format is the same as the on the MPJE® exam. The BEST PA MPJE® online manual. This is the most comprehensive online manual available for preparing for the PA MPJE®. secure shopping cart and transaction handler. Prices are in U.S. Dollars. ©2019 MPJE® Made Easy. All Rights Reserved. :: Web Design & Development by IC9design. Disclaimer: MPJE® is a federally registered trademark owned by the National Association of Boards of Pharmacy® (NABP®). The content within this website and the prepatory products created by MPJEMadeEasy are in no way authorized or sponsored by the NABP®.